Arba Kanfot made of Poly Cotton for everyday religious use. Poly Cotton Tzitzis is a practical choice for good quality and affordability. 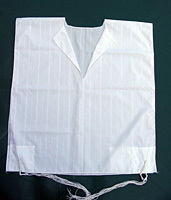 Poly Cotton Regular Tzitzit, a comfortable light weight Tzitzis for all ages. Buy a batch of these and keep washing them as your everyday laundry. It is recommended to order Meshtzitz bags that is meant to protect the fringes in wash.
Price reflects size #2, select from the options. Sizes #18 and up is tied with hand made Tzitzis.